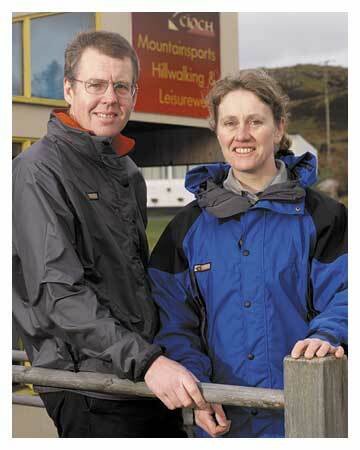 Neil and Helen Urquhart have been designing and manufacturing outdoor clothing for individual customers since 1988. From personal use, feedback from customers, professional mountaineers, rescue teams and other organisations, we have developed a range of clothing which excels in all weather conditions. We think this catalogue gives an excellent summary of our products, but if you would like to find out more, then please e-mail or call us on 01470 572707. All changes to garments or materials shown on this website represent our continual effort to improve our products, using newly available fabrics and feedback from our customers, including professional mountaineers. In all cases, the essential ‘look’ of each garment remains the same as in the photographs. Clothing from Paramo, Montane, Lowe Alpine, Sprayway, Trespass & Meindl boots, as well as walking and climbing accessories, and local books and maps. Please call 01470 572707 for further details.